Earlier this month Netentertainment launched a new slot NRVNA: The Next Experience. This game could until previously just be found at some selected casinos such as Kaboo and Thrills. But from now on you can play NRVNA at most casinos online which feels great. NRVNA is actually not the only slot that Netent is releasing this month. Tomorrow it's time for another brand new game to go live when the title When Pigs Fly has it's premiere. 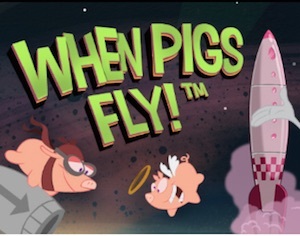 When Pigs Fly is a playful game with loads of colours and cheering background music. As always you get to enjoy many nice features like re-spins, wilds and free spins. If you want to be first in line to play the new game you should visit Guts right now. This Wednesday this casino is offering you up to 50 free spins to use during the premiere! Today you can join a fantastic promotion at Guts where you have the chance to earn loads of free spins on the new Netent slot. The promotion is open for all active members and the free rounds that Guts is offering you are free from wagering requirements. Also, When Pigs Fly has a lowest bet level of €0.5 which means that the free spins on this slot are much more valuable than free rounds on games like Starburst. In order to get spins to the premiere of When Pigs Fly you only need to play for real money on optional slot at Guts this Wednesday. You can get up to 50 free spins with bet level 3 activated but exactly how many free rounds you earn depends on the amount you wager on slots during the day. The minimum requirement for earning free rounds during the day is wagering of €100. This will entitle you to 6 free spins but you can get much more if you just wager more money. All premiere spins will be available for you on When Pigs Fly tomorrow when the game is visable in the casino. As you might be aware of Guts is an online casino where there are loads of promotions going on. For example there are 2 weekly offers that is running at Guts all year. Like tomorrow's campaign for example! This campaign is called Thursday Triple and during this promotion you can collect free spins for 3 days. All you have to do to join the promotion is to deposit and wager at least €20 in the casino. This will entitle you 10 free rounds per day during following 3 days. In other words the weekend is secured! But you could also get 20 free rounds per day during 3 days if you deposit and wager €50 or more instead. Your first campaign spins will be available for you on this week's slot on Friday by 11 am.